Got questions? Check out the answers in our FAQs. 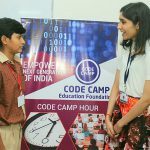 What is Code Camp Education Foundation? At Code Camp, we think all children should have the opportunity to learn to code, no matter who they are or where they come from. To do this, we support a nationwide network of schools and volunteers who run free coding camps for children aged 9-16 to build and share their ideas, learning along the way. Code Camp working model is very simple & well defined. If you are a school or an organization and you want to find run Code Camp, you can register on our website as a school & contact us. If you are a student or a parent and you want to join the course then you can visit our website and read about the courses. If you find it is suitable for you then register to our website. If you want to be a volunteer at a venue, you can register on our website as a volunteer. How do I know how to run a Code Camp? You can visit our website to know about us and about the program and also to know about how we work. We provide training for our volunteer, who covers all you need to know, including the feasibilities of running a Code Camp. If you cannot understand then contact us from our website, we will provide all the information face to face and clear your doubts. How long does it take to run a Code Camp? Please visit our programs page on our website. Can I see the materials you teach? Yes. Once you register on our website & complete your registration process then you will able to see the materials. The projects are step-by-step guides for children to follow. Each project teaches a different programming concept and builds on the skills learned in previous projects. What equipment do I need to run a Code Camp? If you are a school or an organization then you require a computer lab with above requirements. Can I visit a camp before I start? Yes, you can visit and attend our trial session but for that, you have to contact us and register your name. How much does Code Camp cost? All of our materials and resources available for free Hooray! You can get in touch with us at hello@codecamp.org.in – we love to chat! Our team members are also on hand to support you in your local area and you can attend our events across the India to meet others. Can I donate to Code Camp? Yes! We welcome donations to continue growing and being able to teach as many children. You can donate to us via bank transfer/online.